Scentsy Success will come as you touch your business daily. Figure out your “why” and look at it every day. I posted my “why” on my bathroom mirror, fridge, and next to my bed. I called everyone I knew to see if they would host a party. If they weren’t able to host, I would ask if they knew anyone. You have to ask! People want to help you succeed. Set goals and create a dream board. Follow up with customers. If you want to have Scentsy Success then you need to grow a team. Be willing to think out of the box. You have to do things that are uncomfortable. 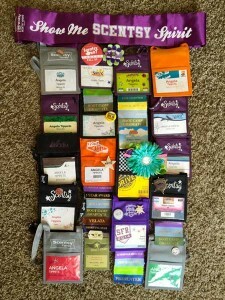 It’s fun to go back and look at all the nametags from different Scentsy Events. I went alone to my first Scentsy Convention. Now I go with hundreds on our team. Having success with Scentsy was not an accident. If you have determination, focus, and a plan you can be successful. Don’t be afraid to go after it! If you want to succeed, make your dreams bigger than your fear. 2013 Cared for my daughter during her battle with cancer – was able to be with her 100% of the time! She is now CANCER FREE! Ready to Start Your Scentsy Journey? For more information on how to start selling Scentsy and how you can join our awesome team, click on our “Join” link, or contact me. Becoming a Scentsy consultant is easy. Simply fill out the secure information, and you can start selling Scentsy products now.